MUJI is a highly successful Japanese retail company that sells a wide variety of household and consumer goods. What is interesting is their ‘non brand’ market positioning. They decree for themselves the status of not being a brand, but paradoxically it is the great clarity they have around who they are and who they are not that makes them such a distinctive and compelling brand. MUJI works very hard at claiming its non brand positioning. It’s name was derived from the first part of Mujirushi Ryohin, which translates into ‘No Brand Quality Goods’. It’s website declares in the very first sentence ‘… MUJI is not a brand.’ Instead it claims that MUJI creates products with a view toward global consumption of the future. That it does not create products that lure customers into believing that ‘this is the best’ or ‘I must have this’. Instead they like their customers to feel the rational sense of satisfaction that comes not with this is the best, but this is enough. Best becomes enough. But the ‘enough’ principle is certainly not a near enough approach. MUJI manifests its offer to the market with an amazing attention to detail – all devoted to creating simplicity and minimalism in its designs and operations. The desired end result for MUJI is quality products at lower than usual prices. Every element is streamlined from the selection of materials through to the manufacturing processes used, from the colour options available to level of packaging, MUJI lives minimalism. This also extends to its environmental footprint. But regardless of what MUJI says, all of this adds up to a superbly managed brand. Sure there is no logo, but customers know they are buying a MUJI product. It is a case of where less is best from a brand presence perspective, the minimalist aesthetic of MUJI makes it distinctively theirs. Yes, their communication focus is purely on functionality and price at a store level, none of the soft fluffy stuff that may be directed at image and emotional levers – but do not be fooled. MUJI delivers a real emotional pull to its customers simply because it openly declares its philosophy on consumerism and respectfully invites them into their world to share in this philosophy. When you shop at MUJI you are therefore saying something about yourself and what is important to you. This is exactly what the best brands deliver to their customers, a sense of community built on shared values. 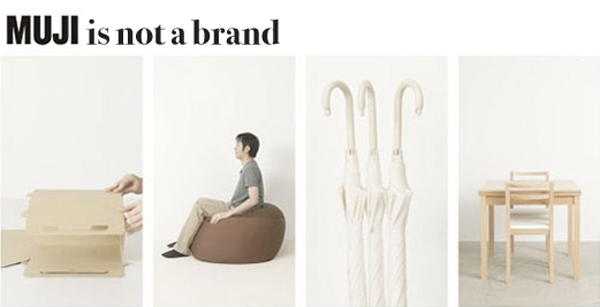 MUJI’s non brand positioning has simply claimed some white space for where and how to position itself in the market. It is immensely considered and it is extremely well executed. It is a great brand! Having clarity around how you wish to position your brand is fundamental, and we thrive on the fundamentals, give us a call. I love MUJI and I agree with you, it is definitely a brand. Great brand strategy – we’re not a brand. Surely that approach can only last so long – it’s like taking an appraoch of I am not pregnant when you are. About 15 years ago NBA superstar Charles Barkley appeared in a Nike TV spot claiming, “I am not a role model.” He was wrong. Professional athletes are role models whether they like it or not. Businesses are brands merely by virtue of their existence. How they embrace that fact defines their approach to branding. Even positioning yourself as the anti-brand or non-brand is branding.